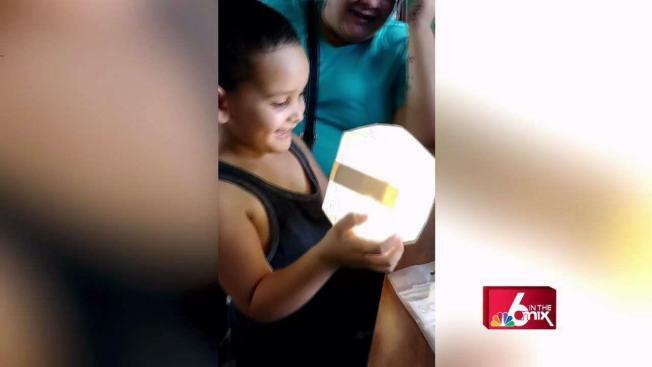 As Puerto Rico continues to rebuild following the devastation of Hurricane Maria, one group is hoping to shed some light on the island nation where many residents remain in the dark. Joy, laughter, and a smile aren’t in abundance in a place with shortages of food and water exists and only 22 percent of the population has power. But some families received instructions on how to charge up their new gifts. Called Solights, it’s a solar puff rechargeable light that will last between eight and 12 hours. “Everywhere we went they were so excited. ‘We haven’t seen anyone, where is the aid? Are you FEMA?’ We’re like no, we’re volunteers,” said Dr. Alison Thompson, a humanitarian working to help the country rebuild. Thompson was a first responder during the tragic events of September 11th, an experience that moved her to become a full time humanitarian. The same goes for Al Magdaleno as both answered the call to help for over 17 years. They are just two of a crew who walked door to door in the most desperate regions of the island giving light and water filters. The only reason they're speaking with NBC 6 in Miami is because they need more supplies for the people there. The fabric is made of sail cloth - durable and water proof, it folds flat or puffs up, the Velcro strap makes it easy to secure and it has different settings for light - low, high and emergency. It charges for five hours in the sun, providing eight to 12 hours of light. The group has raised $100,000, spent it, and delivered over 15,000 lights across Puerto Rico. “We go door to door and we give everybody a hug, we want to see them we want to meet them we want to smile at them and let them know someone cares,” said Magdaleno. The support of celebrities has helped shed light on these lights. Paris Jackson, the late Michael Jackson’s daughter, joined them on a mission as did actor comedian John Leguizamo. For more information and how you can help, you can visit thirdwavevolunteers.com or citizens-of-the-world.org.